Happy Mother’s Day to all the mothers, feline and otherwise, out there. My own mother was a stray cat who gave birth to her litter in Camden NJ. My earliest weeks were spent on the streets of Camden. It was there I was rescued by Furrever Friends, and eventually came to live in Philadelphia with my purrsonal assistants, Burnell and Betsy. Although, I haven’t seen my mother since, she is the reason I am here today and able to share my love of music with you. 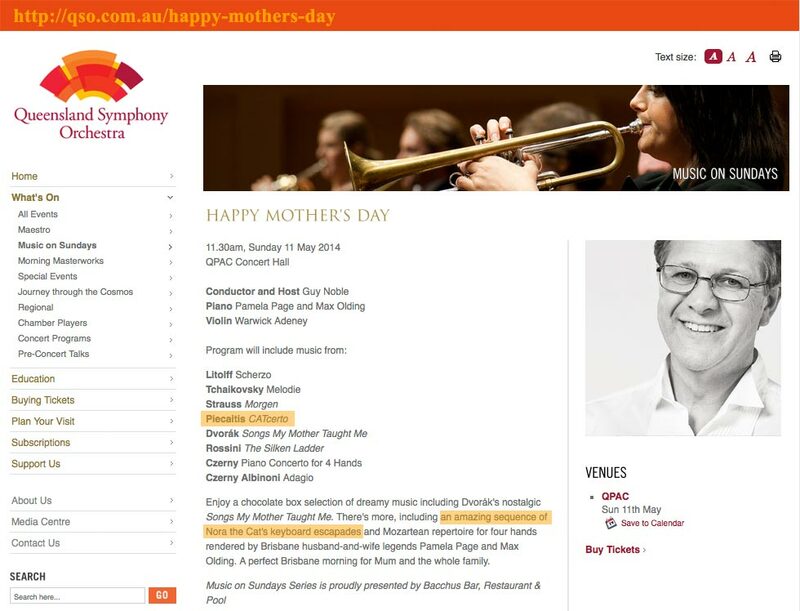 I was reminded by all this when I received the news this morning from Mindaugas Piecaitis, my friend and composer of CATcerto, that CATcerto is being performed on Mother’s Day, Sunday, May 11, 2014 by the Queensland Symphony Orchestra, under the direction of Guy Noble. And yes, I’m talking about Australia. For all my friends and fans from downunder, details of the concert can be found at http://qso.com.au/happy-mothers-day.